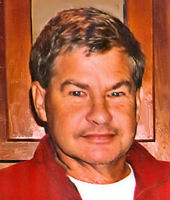 Provide comfort for the family of Thomas Bruce Peck with a meaningful gesture of sympathy. Thomas B. Peck, 65, passed peacefully on February 24, 2019 in the comfort of his home, surrounded by those he loved dearly. Born in Hartford. CT on February 9, 1954, the son of Norma R. and William C. Peck, Tom graduated from Somers High School and attended the University of Connecticut, the University of Vermont and Saint Michaels College before beginning a successful career as a builder, general contractor and cabinet maker. He was man of many interests and talents who was never more content than when sharing stories across the table at deer camp or after coming off the river with fly rod in hand. His love for the outdoors was surpassed only by the joy of sharing it with his favorite kind of people. He will be remembered for his depth of knowledge, his refreshing sense of humor and his love of friends and family. In addition to his parents, Tom was predeceased by his brother-in law and mentor, Ken Johnston of Pittsford VT. He is survived by his loving wife, Pamela (Bjorn) Peck of Frankfort, his son Robert Peck, wife Amanda and his sweet grandchildren Sophia, Natalie and Thomas of Glenburn. He is survived also by his step-mother Mary Peck of CT, his siblings, Bill Peck and wife Debra of SC, David Peck and wife Sue of CT, Ginger Johnston of VT, Loretta Gorcenski and husband Ed of CT, Jeni Carey and husband Billy of CT along with several nieces and nephews. Friends and family are invited to gather from 5-7 p.m. Saturday, March 16 at the Family Reception Center of Brookings-Smith, 163 Center Street, Bangor with an informal sharing of memories in celebration of Tom’s life beginning at 6:00 p.m. Those who wish to honor Tom’s memory may make donations to Northern Light Home Health and Hospice, 885 Union Street Suite 220 Bangor, ME 04401 or to The American Diabetes Association at www.diabetes.org. Condolences to the family may be expressed at BrookingsSmith.com. We encourage you to share your most beloved memories of Thomas Bruce here, so that the family and other loved ones can always see it. You can upload cherished photographs, or share your favorite stories, and can even comment on those shared by others. Provide comfort for the family of Thomas Bruce Peck by sending flowers.